It's mid week and I hope everyone's having a good week so far. 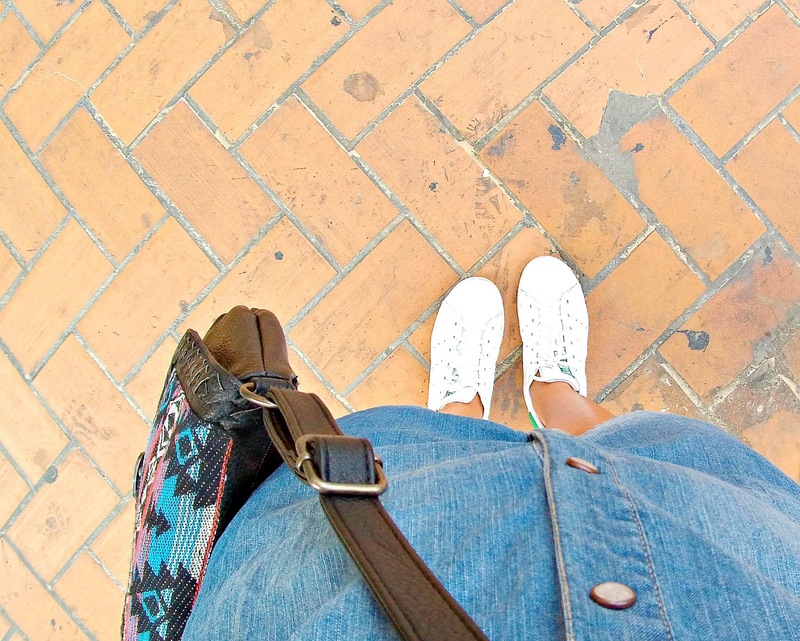 Today's fashion post is a denim dress mix up with white sneaks and fringe bag. When I first saw this dress on Splash, i thought it was a chambray but when I touched it, you will know that it's a denim. But what really differentiate this two cloth? A chambray is a plain weave fabric woven with a colored yarn in the warp and a white yarn in the weft. Like chambray, denim is made with a colored yarn in the warp and white in the weft, but is woven in a twill construction. The chambray’s warp and weft threads will alternate one over the other, while denim’s warp thread will go over two threads in the weft before going under one. Typically, you will notice a lighter color to the underside of a denim fabric, whereas the underside of chambray will appear much more similar to its face side. Obviously, the denim that we are all most familiar with is the kind used to make jeans or 90’s style Jean Jackets. This denim is generally very heavy, and in most cases would not make for a comfortable shirt.